Allan MacNutt learned to fly in the R.C.A.F. during WWII and served overseas with the British Navy as a pilot on Seafires during the last two years of the war. Back home in Canada he started a flying school while awaiting more challenging opportunities. In addition to teaching many young people to fly and helping them into an airline career, he also taught his wife and three sons to fly. All of his sons have enjoyed their careers in aviation, Bob as captain for major airlines, currently Air Canada, and Jack as a senior Air Traffic Controller. When aviation became more popular he became involved in test flying with Canadair in Montreal, then moved to high level air photo survey working in Canada's Arctic in the summer to help complete the mapping of the north. When the brief summer ended each year he would ferry the company's aircraft to contracts in various countries in South America or Africa to provide utilization of equipment during Canada's winter for photo mapping or mineral survey projects overseas. He spent eight years in the government as an air carrier inspector promoting aviation safety and served with various branches of I.C.A.O. for the United Nations. He has flown many types of aircraft in many different countries and studied the local culture. In later years he returned to contract flying and flew water bombers and fire bombers in forest fire protection in western Canada, Northwest Territories and the Yukon. On retirement after 50 years of flying he wrote his first book ALTIMETER RISING, which has become very popular in the aviation community. 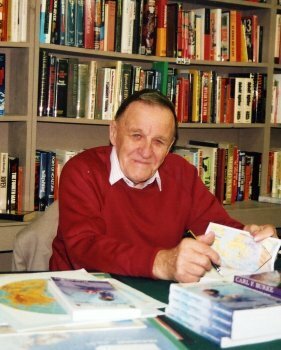 His second book, a biography of CARL F. BURKE, was about the Dew Line and its long-term effect on the Canadian aviation industry and the importance of the many northern airports built in the north to open that huge area to exploration and development. To write CANADA'S ARCTIC SOVEREIGNTY he returned repeatedly to the north, sometimes with his sons who assisted in interviews, photography, and studying the potential of that huge barren area with it's vast resources of oil, gas, diamonds and gold, and getting to understand the natives and their problems. They visited many points of interest from Alaska to Greenland and cruised the legendary NORTHWEST PASSAGE in a Russian icebreaker. He spent many years reading the history of the north, studying Arctic lore, meeting northerners and following mining, social and political developments. His book provides a timely and very well-informed look at northern Canada today and a helpful source of information for all Canadians. Al and his wife live in the Fraser Valley of British Columbia. With his wife and sons he is still travelling from sea to sea in Canada researching Canadian history any aboriginal issues for more books.